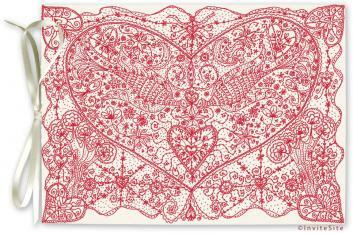 Romantic Vintage Wedding Invitations letterpress printed in glorious red ink. This Do-it-yourself booklet has an original illustration letterpress printed on the front panel. Interior enclosure pocket. Letterpress printed in dark red ink on crisp white, thick cotton paper. Super clean and polished finish. Booklet is diecut and scored, with a handsome pocket for rsvp set or enclosures. Two panel invitation sheet - perfect for 2 language wedding invitation. Assembly is easy to medium. All cotton paper and envelope. An Eco Design with a Vintage Flair. DIY invitation opens to a modern landscape measuring 14 x 5 inches. The invitation sheet attaches to the portfolio with a length of thin satin ribbon that you can tie in a knot or a bow. Also, simple binding thread is also available for a cleaner finish. Call us. PAPER FACTS: Portfolio wrapper made from recycled 100% cotton paper, made in USA. Diecut and letterpress printed here in Pasadena. Inside invitation sheet made from 100% cotton paper. Envelopes are matching cotton paper, baronial (pointed) flaps. Colors: Crisp white, deep red ink letterpress vegetable inks. Tie:Bind with length of thin satin ivory ribbon. Binding thread also available for a clean looking finish.